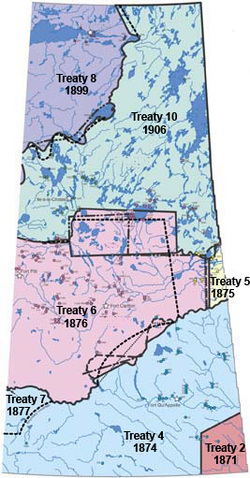 label treaty areas and cities using a map of Saskatchewan and the interactive map that is found on the OTC website http://www.otc.ca/ABOUT_TREATIES/Treaty_Map/. The answer key is also provided. * This suggested activity may be adapted by encouraging students to think of a family friend or relative who lives within Saskatchewan but not their hometown. This will enable them to recognize that all people of Saskatchewan are a part of treaty, not just people who live in the same town/city as they do. They can complete the activity attached below. Completed activities may be displayed on a bulletin board under the title "We are all treaty people". * Use handout of pages 54-57 from Legacy to complete a chart of information on each treaty (a scanned copy of the handout and a document containing the chart for completion are at the bottom of this page).